wins. While this is not the first time this feat has been accomplished, it is a first for the decorated Schurter. The Scott-SRAM MTB-Racing team won in a time of 3:37.41 to extend their overall lead over Cannondale Factory Racing to more than four minutes. "I thought I could do well, but not this well," Lars Forster commented at the finish. "This is amazing." 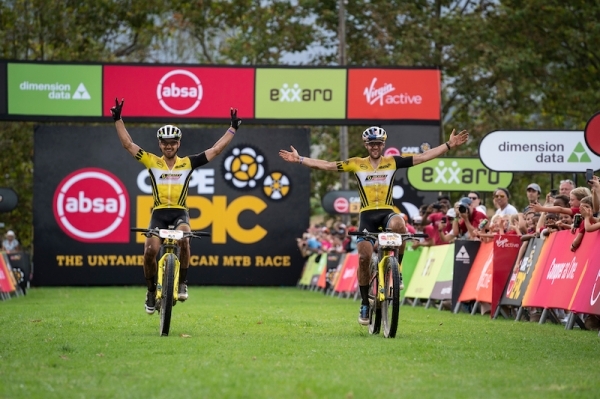 The 25-year-old was visibly ecstatic with his debut Absa Cape Epic performance to date. "He will just get better," his senior partner Schurter quipped. "This (stage win) was not planned, but we are very happy with the hat trick." Scott-SRAM MTB-Racing didn't have it all their own way however. As is tradition, by this point in the race the General Classification contenders have started to settle and tend to watch each other, leaving teams who have already lost time on GC to make moves for stage honours. KROSS-SPUR – who eventually finished second on the day – along with both the Trek Selle San Marco teams clearly had that goal on Tuesday. At the 48-kilometre mark Scott-SRAM MTB-Racing once again put down the hammer and Absa African Men's Special Jersey wearers SpecializedFoundationNAD, Canyon and the Bulls Heroes lost touch. At the old Houw Hoek pass climb – some 65 kilometres in – it was clear that the winner would come from the front group of Scott-SRAM MTB-Racing, Cannondale Factory Racing, KROSS-SPUR or Trek Selle San Marco. "There were a few tense moments early because there were a lot of teams who wanted to get away for a stage win," he said to sum up the day. "We were lucky that we could keep up with the Yellow Jersey and not lose too much time." There were others who weren't as fortunate; most notably the Investec-songo-Specialized outfit of Jaroslav Kulhavy and Sam Gaze. The pair stayed in touch until around 35 kilometres, when the effects of Gaze's Stage 1 crash became apparent. Gaze bravely soldiered on, nursed along by Kulhavy. This allowed their designated backup team of SpecializedFoundationNAD to ride their own race with Matt Beers and Alan Hatherly finishing Stage 2 in seventh place, consolidating their lead in the Absa African Men's Special Jersey race. Gaze is determined to continue however, and he, along with the rest of the field, will tackle 107 kilometres with 2800 metres of climbing which features the Groenlandberg climb, yet another icon of the race.